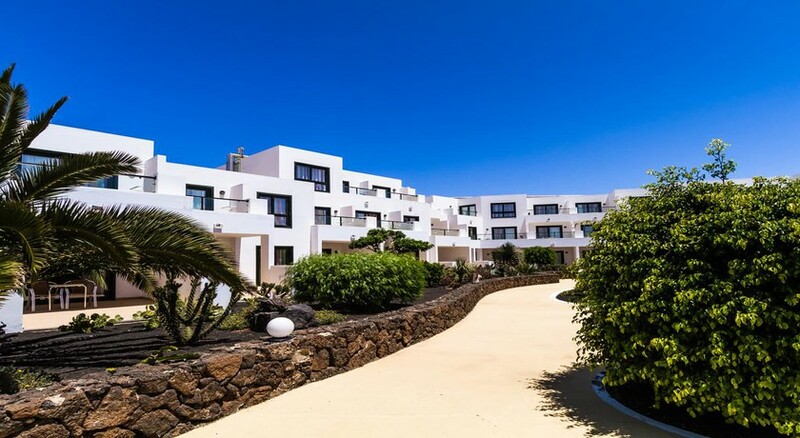 The BlueBay Lanzarote, located in Costa Teguise, is the perfect place to stay while holidaying in Spain. 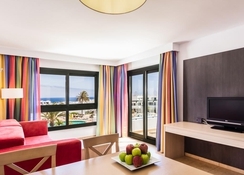 An all-inclusive, semi-luxury hotel, BlueBay Lanzarote is a family-oriented property, which features several recreational activities within the hotel premises. With 200 guestrooms designed to ensure a comfortable stay, the hotel is undoubtedly one of the best in the region. The on-site restaurant at the hotel features extensive menus from various international cuisines, while the poolside bars of the hotel serve some of the most exquisite fusion drinks and mocktails you have ever tasted. Two swimming pools, well equipped with parasols and loungers, complement the other sports, fitness and recreational facilities of the hotel ranging from a state-of-the-art gym and a spa. 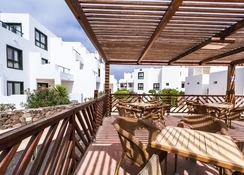 Blue Bay Lanzarote is just 700 metres from a sandy beach in Costa Teguise. Located centrally on the Canary Islands, it is surrounded by several shops, restaurants, bars and clubs. For Golf lovers, there is Costa Teguise Golf Club, which is just 3km from the property. 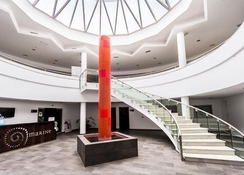 Lanzarote Airport, situated at a distance of 13km, is the nearest airport to this 4-star property. The hotel features 200 guestrooms, divided into 188 single bedrooms and 12 two-bedroom apartments. All rooms feature air conditioning, satellite television sets, electric kettles and safe deposit boxes. En-suite bathrooms with bath amenities and hairdryers are provided across all the accommodation categories. There are also corners with dining tables, chairs for four and sofa beds to make sure that guests feel at home. A standard room also features a functional kitchenette with a fridge, a stove, an electric kettle and basic cutlery to help you make your favourite dishes. BlueBay Lanzarote serves breakfast, lunch and dinner buffets at its main restaurant. The menu at the restaurant is pretty extensive and you can choose from a diverse range of international dishes and beverages. Guests can savour an array of light meals and snacks along with fusion drinks, cocktails and mocktails at the poolside bar of BlueBay Lanzarote. The bar plays soothing music and puts up live shows to help you set the right mood for a night of fun and frolic. BlueBay Lanzarote is a complete holiday home. Apart from all the other facilities inside the rooms, the hotel also has two swimming pools, a fully-functional spa, a kid’s club, table tennis & lawn tennis courts, and designated areas for playing football, basketball and volleyball. The hotel also arranges for rifle shooting, water polo, archery and a host of other outdoor games. The pools come with free loungers and parasols. For the little ones, there is a kid’s club, which organizes various workshops and fun-filled activities. Lovely, friendly hotel we have come in April for the last 3 years fantastic food full English breakfast every morning! Nicely situated near the sea and shops , sports bar near by , great animation team and entertainment . Excellent staff and very friendly hotel. Exceptional food choices. Good entertainment and fun for all the family. We had a wonderful stay at the blue bay costa teguise lanzarote we will definitely be coming back in the future. We're a retired couple in our 50's and stayed for 3 weeks in Jan 2019. All inclusive. Food choice and quality was very good. Room was very clean and well equipped. Maid service every day with clean towels etc. Hotel location was quite central but quiet. We could walk over the road to the promenade and have a lovely walk. Although we were AI there a some great restaurants nearby including an Indian and Chinese just outside the hotel. We tried both and they were great. The hotel staff were very polite and nothing was too much trouble. There's a bus stop just down the road and we used it to visit other parts of the island. Bus prices were very cheap. We found the hotel wifi pricing a little expensive so bought additional data and used a mobile phone as a hotspot. This way we could access UK TV via our tablet which we plugged into the room TV. Take your own HDMI cable. Overall we had a nice stay and enjoyed our January time in the Canary Island sun. Easy walk into central Costa Teguise and the food was plentiful and very good. Very nice pool and bar area. Rooms were very nice but you could hear the people above all the time moving chairs talking etc so noisy. Entertainment not brilliant but the staff were really nice and very helpful and there were lots of good trips to go on. I stayed at this hotel April 2017 with my children 28, 11 and 12. The facilities at the Hotel were fine there was a Hall where in the busy season I’m sure would be full with families for the entertainment. Was quite empty during our stay but didn’t bother us. There was a lovely bar which was more an area for the adults to socialise and have a drink in the evenings. The pool was too cold for me and the kids moaned too but I was there in April so hadn’t had time to heat by the sun the pool side bar was always stocked to help yourself to drinks day and night. The apartment we had was great, fully equipped and location was perfect. The hotel was a little further out from the main town as I’d had like. We were however able to walk down to town and taxis were cheap enough to jump in. The staff were friendly and helpful and the service was great. The food was nice enough a good variety, the kids found something to eat daily with no complaints. I enjoyed the food but I do like a Mediterranean style menu. All in all it was a great holiday with no real complaints. Worth the money paid and would recommend for families.